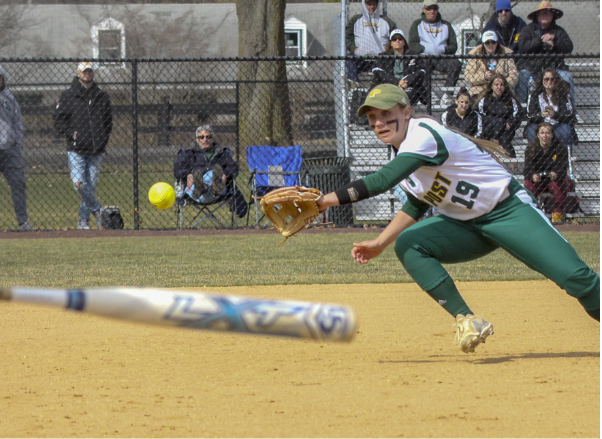 The softball team played a victorious double header at home on Sunday, March 24, against the Wilmington Wildcats, putting them on a seven-game win streak for the season. The Long Island Ducks Fastpitch travel team coached by LIU alumna and former softball team member, Paige Swantek, cheered the Pio-neers on from the stands. Wilmington scored the first run of the game during inning one. LIU turned it around at the bottom of the inning when sophomore Breanna Klaiber hit a single into left field. A throw error advanced her to second base and sent junior Abbey Fortin across home plate to score the first run for the Pioneers. Klaiber followed her home after sophomore Hanna Finkelstein hit a double to left center, placing LIU in the lead, 2-1. Wilmington tied the score at the top of the fourth, giving Ducks team members a game to remember. At the bottom of the fifth, Finkelstein grounded the ball between shortstop and third base, landing her a sure single. A bunt from junior Megan Sneeden advanced Finkelstein’s pinch runner, Ashley Casazza, to second base. Sneeden was thrown out at first base, leaving Wildcat infielders without a forced play. Sophomore Patricia Dun followed up with a single to left center, and because of two Wildcat fielding errors, Casazza passed home plate, placing the Pioneers in the lead, 3-2. Post’s defense held Wilmington down for the remainder of the game, earning them the first match win. 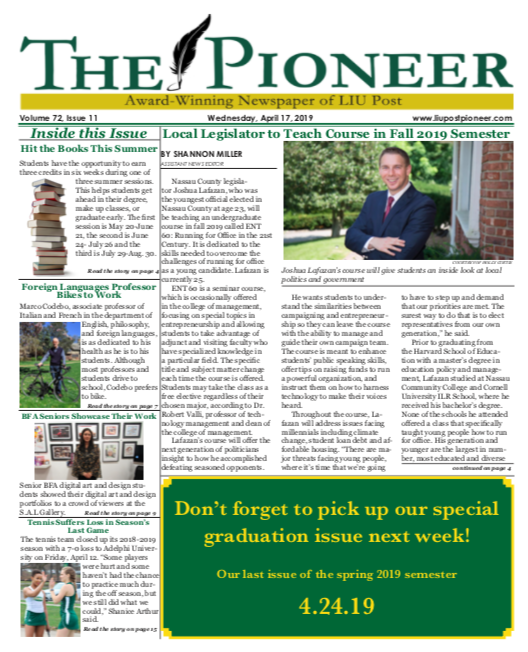 Swantek, who brought her team of 12 to 14-year-olds and their parents to observe a college team play the sport they love, is disappointed that the 2019 season will be the last for the Pioneer softball team. “They’re very good,” she said. “I think they’re going to have a successful year.” Swantek played for the team in 2014 when they represented the East Coast Conference in the NCAA Division II championships in Virginia. She now coaches because she wants to “give back to the community.” Her team of teenagers were sad to leave before the second game since they had yet to see a Pioneer hit a home run. The Pioneers didn’t see much action in the second game until the top of the third inning. 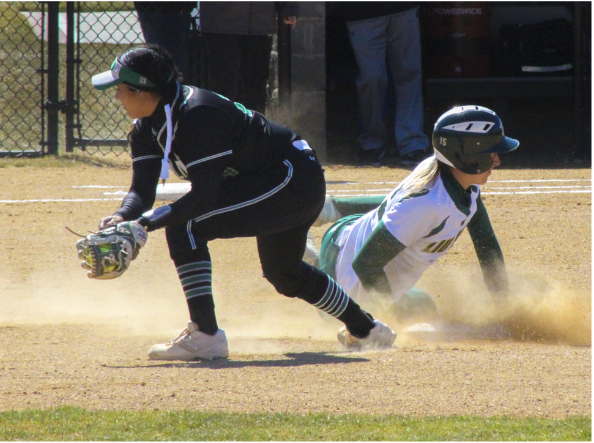 Senior pitcher Hannah Olshevski picked up a grounder and made a quick pivot to get the out at second base, which resulted in enough time for Dun to make the double play at first base to end the inning. The Pioneers landed on the scoreboard when Fortin, who was recently named ECC’s player of the week, slammed the first home run of the day into left field, which consisted of two runs batted in, giving the team a two run lead. The Pioneers scored a third run in the bottom of the third when senior Leah Mele hit a single to center field, bringing Sneeden home to change the score to 3-0. Wilmington gained two runs in the fourth due to a stolen base and a fielding error, and then scored a third run after hitting back-to-back doubles at the top of the fifth to tie the score 3-3. They scored a fourth run at the top of the sixth, but their lead was Pioneers; Laird tied the game again with a home run to right center. The Pioneers took the win at the bottom of the seventh inning after Mele hit a homerun over the left field fence and into the stands where the Ducks team had been seated earlier that day. As Mele rounded third base to head home, her teammates were waiting for her at the plate, cheering. Senior infielder Ashley Melendez is pleased with her team’s performance. “I feel we ex-ecuted all parts of the game: pitching, hitting and fielding,” she said. “Every game is a double header. We end up at the end of the season with about 50 games under our belt.” Both game wins were really important, according to Laird. “I’m glad that our team pulled through today; we all did our part. Even Leah came through at the end and had a home run, which was great. So, it was a really good feeling,” she said.